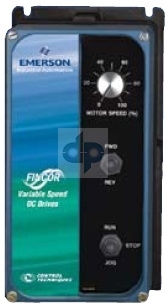 The Fincor 2100 series is a non-regenerative, analog, DC drive, most used for motoring in one direction when reversing is not needed. With this drive series reversing is accomplished through additional, optional controls. Motor speeds and torque are adjustable through an external potentiometer. Non-regen drives are compact, less expensive and are ideal for custom system building. Typical applications for this drive are extruders, conveyors and mixers. Fincor 2200, 2330, and 2600 series all offer both regenerative and non-regenerative types. Regenerative or four-quadrant drives are required when frequent braking is necessary or reversing is needed. Drive units are shipped calibrated for desired hp rating but jumpers can be adjusted for others. Some units are available with an additional jog control. A typical application for a regenerative drive includes material payoff and conveyor systems. The Fincor DC series drive offers panel mount, enclosed or open chassis styles. Enclosed models offer NEMA ratings of 1, 12 or 4. 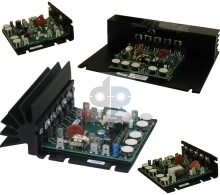 Input voltages for this series are interchangeable, 115 VAC to 230 VAC, single-phase. Horse power ratings are 1/12 hp to 3 hp in the 2100, 2330, and 2610 series. The 2600 series offers ratings up to 5 hp. Fincor single-phase DC drives offer a complete series of reliable, compact drive solutions.